Manchester City's players will be to blame if they fail to qualify for next season's Champions League, says defender Bacary Sagna. City have won only one of their past four Premier League matches, drawing 2-2 with Arsenal on Sunday, and are in danger of dropping out of the top four. Manchester United - two points behind - will beat them to fourth place if they win their final two games. 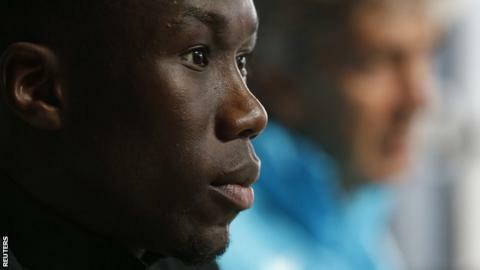 "We had everything in our hands to be the best," said 33-year-old Sagna. "If we play like we did against Arsenal we are the best team, but we have to play like this all season. "We deserve it. We gave it a lot. Of course we are not perfect, of course we could have done better, but we deserve to be in the Champions League places." If United win their game in hand against West Ham at Upton Park on Tuesday, City will drop to fifth before their last game of the season at Swansea on Sunday. Manuel Pellegrini's side were favourites to win the Premier League after opening the season with five successive victories. However, they have won only 14 of 32 league games since, and have managed one victory from 14 matches against the other teams in the top eight. City reached the Champions League semi-finals for the first time this season, when they were beaten by Real Madrid.